134 Beacon is located on the north side of Beacon, between Berkeley and Clarendon, with 132 Beacon to the east and 136 Beacon to the west. 134 Beacon was built ca. 1860. as the home of William Bramhall, a merchant and president of the Shawmut Bank, and his wife, Betsey (Shaw) Bramhall. They previously had lived in Brookline. It was originally numbered 117 Beacon, but re-numbered as 134 Beacon ca. 1862 when homes were built on the south side of the street. William Bramhall purchased the land for 134 Beacon on March 31, 1859, from the Boston and Roxbury Mill Corporation. Click here for an index to the deeds for 134 Beacon. The Bramhalls’ five children — William Thomas Bramhall, Thomas Murdoch Bramhall, Robert Bramhall, Elizabeth Shaw Bramhall, and Maria Shaw Bramhall — lived with them. Thomas Murdoch Bramhall, a wholesale grocer, married in June of 1865 to Mary Prince Winship; after their marriage, they lived at 145 West Newton (where he died in September of 1870). Elizabeth Bramhall also married in June of 1865, to James Pierce Stearns; after their marriage, they lived in Brookline. Robert Bramhall was committed to McLean Asylum in Somerville in the late 1860s. William Bramhall died in April of 1871. Betsey Bramhall continued to live at 134 Beacon with William T. and Maria Bramhall. Maria Bramhall married in November of 1872 to George Butters, a real estate dealer in Chicago; after their marriage, they lived in Oak Park, Illinois. Betsey Bramhall died in July of 1873, and William T. Bramhall continued to live at 134 Beacon. On March 27, 1874, the executor of his father’s estate transferred the property to him. In April of 1879, William T. Bramhall married Adeline Crowell. After their marriage they lived at 134 Beacon until about 1882, when they moved to 330 Walnut. On September 14, 1882, 134 Beacon was purchased from William T. Bramhall by William Tenant Hart. William Hart was a banker and president of the New York and New England Railroad. A widower, he lived at 6 East Brookline. 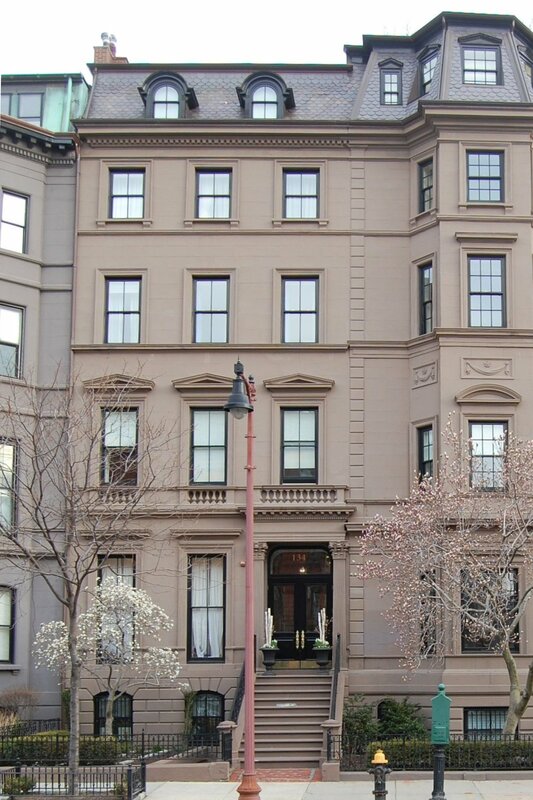 134 Beacon became the home of his son-in-law and daughter, Otis Kimball, Jr. and Caroline Sampson (Hart) Kimball. They previously had lived with him at 6 East Brookline. Otis Kimball was associated with various railroad, banking, and manufacturing companies. In February of 1884, William Hart remarried, to Emma E. Porter, and by the 1887-1888 winter season they had moved from 6 East Brookline to 315 Commonwealth, where they were living at the time of his death in November of 1896. He died intestate and ownership of 134 Beacon passed to Caroline Kimball as his only child. Otis and Caroline Kimball continued to live at 134 Beacon. Their daughter, Estella Hart Kimball, lived with them until her marriage in June of 1907 to Henry Lowell Mason. After their marriage, they lived at 188 Bay State Road. Otis Kimball died in February of 1912. At the time of his death, he was president of the International Belanger Ring Spinning Company. 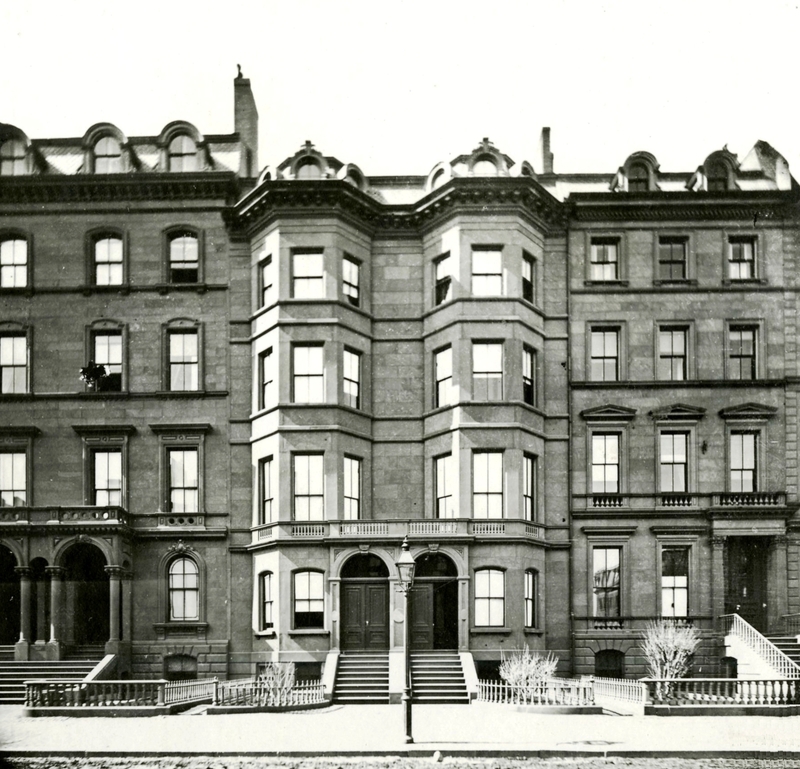 Caroline Kimball continued to live at 134 Beacon until her death in August of 1928. She also maintained a home in Magnolia. 134 Beacon was inherited by Estella (Kimball) Mason. By the 1919-1930 winter season, 134 Beacon had become the home of Henry and Estella (Kimball) Mason. They previously had lived at 67 Bay State Road. They also maintained a home in Prides Crossing. Henry Lowell Mason was president of the Mason and Hamlin Piano Company (founded by his father) and the American Piano Company. He also was an author of historical works about the piano and organ. The Masons’ two children — Helen Hart Mason and Henry Lowell Mason, Jr., an attorney — lived with them. Henry Mason, Jr., married in August of 1939 to Fanny Crowninshield (Homans) Warren, the former wife of Howland Shaw Warren. After their marriage, they moved to 37 River and then to 7 Exeter. Estella Mason died in February of 1940. Henry Mason and Helen Hart Mason moved back to 67 Bay State Road by 1941. 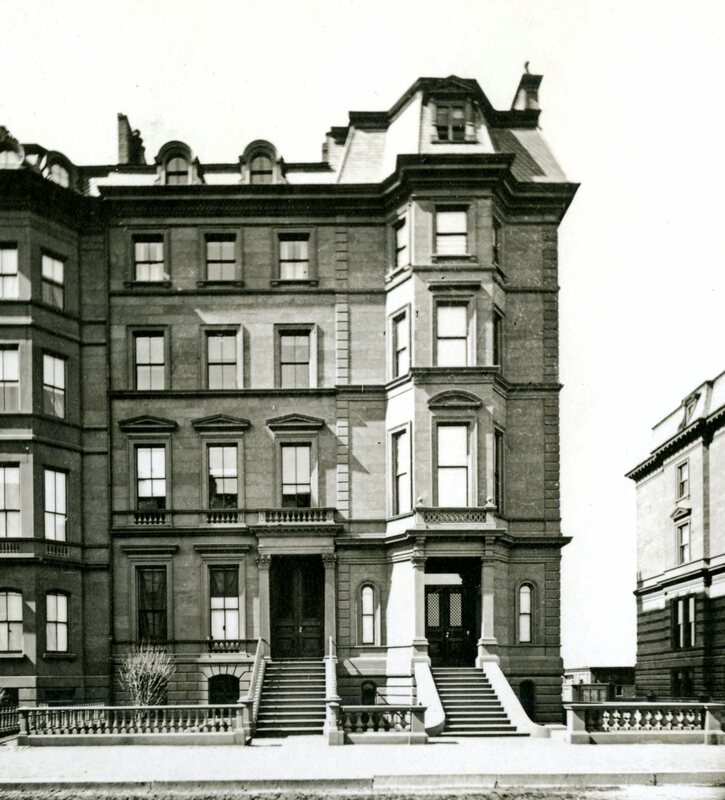 On July 7, 1942, 134 Beacon was purchased from Henry Mason and his children, as the heirs of Estella (Kimball) Mason, by Shirley Clifford Speed, a real estate dealer who converted many Back Bay houses into lodging houses and apartments. In December of 1942, S. Clifford Speed applied for (and subsequently received) permission to convert the house from a single family dwelling into a lodging house. On February 27, 1943, 132 Beacon was acquired from S. Clifford Speed by Helen Bembridge and Louise R. Jenkins. On February 26, 1944, 134 Beacon was acquired from Helen Bembridge and Louise Jenkins by Hulda Cederstrom, a nurse, and her sister, Walborg Cedarstrom, who operated it as a lodging house. Their mother, Bengta (Sundstrom/Sandstrom) Cederstom and sister, Ruth Cederstrom, lived with them. They all previously had lived in Somerville. They continued to live at 134 Beacon until about 1949. They subsequently moved to Brookline. On January 23, 1950, 134 Beacon was purchased from Hulda Cederstrom and Walborg Cederstrom by Miss Mary Brennan, who continued to operate it as a lodging house. She previously had lived at 213 Beacon with her mother, Sophia Annie (MacDonald) Brennan, the widow of Donald C. Brennan. 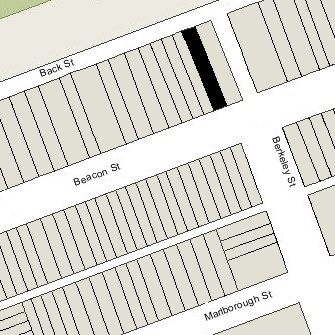 Mary Brennan also owned and operated a lodging house at 30 Marlborough. Mary Brennan continued to live at 134 Beacon until 1964, when she moved to 30 Marlborough. On November 10, 1964, 134 Beacon was purchased from Mary Brennan by Emerson College. It also owned 132 Beacon, where it operated a dormitory. In October of 1964, before taking title to the property, the college applied to remodel 134 Beacon, converting it into a dormitory. As part of the remodeling, it proposed to add a sixth story to the building, which was denied by the Building Department. In November of 1964, the Board of Appeal denied the college’s appeal of the Building Department’s refusal, and the college proceeded to remodel the building into a dormitory without the additional story.